Llama Web - offers information on llama farms, veterinary information resource area, current llama "events" and pointers to llama related services and products, such as llama trekking, bed and breakfasts or T-shirts. A comprehensive site. The Llama Q & A Page - This illustrated set of pages answers many questions that you may have about llamas. This page discusses different kinds of llamas, what they eat, the kinds of sounds they make, what kind of shelter they need, and more. Llamapedia - Written by veterinarians, it is intended to be an accurate source of information on husbandry, breeding, and care. 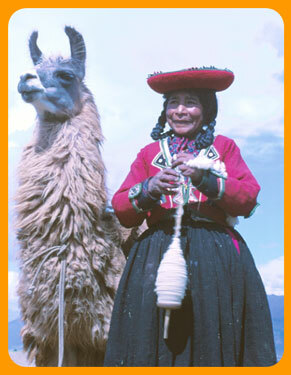 Last of the Llama Treks - A great article written by Victor Englebert about modern day llama trekking in Bolivia. LlamaResource.com - Lots of llama related information including articles, lists of vets, classified ads and llamas and products for sale. Quality Llama Products - The world leader in alternative livestock supply products and distributor of Bonny Doon Llama Packs. Offering secure online shopping. Charismatic Llamas - personal experiences, humor, photographs of llamas doing interesting things, over 100 other Llama and Alpaca sites, products and other sites related to Llamas. Hoosier Llama Association - Dedicated to increasing public knowledge of llamas. Pack Llama Trials Association - The principle purpose of the PLTA is to preserve and promote pack llamas by educating the public in the safe and humane use of llamas as packing companions. This is done by coming together in a social, non-competitive atmosphere and testing the pack llama against a written standard in a realistic packing environment. Rocky Mountain Llama and Alpaca Association - Created for the purpose of sharing information about llamas and alpacas with fellow owners and the general public. Western Idaho Llama Association - an active organization that provides opportunities for friendships, learning, and fun through social events, shows, pack trips, youth programs, parades, and community service activities. Bonny Doon Alpacas - Our sister company. Breeding quality alpacas since 1984 in Santa Cruz, California. Offering alpacas for sale, alpaca stud services, The Complete Alpaca Book, links, photos, stories, and more. Rangemore Llama Farm - a 30 acres farmlet near Kerikeri, in the Bay of Islands, New Zealand. Fantasy Farms Alpacas - A top-quality alpaca ranch in Terrebonne, Oregon offering alpacas for sale in a wide variety of colors. Acorn Alpaca Ranch - Located in Millis, Massachusetts, this large alpaca ranch offers show-winning huacaya alpacas for sale and stud.